The media release was wrong. 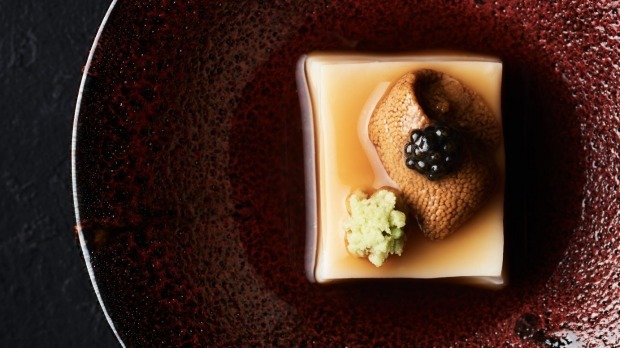 "Acclaimed chef Tomotaka Ishizuka is set to introduce Australian diners to the rarefied world of Japanese haute cuisine known as kaiseki," it said. But when the 16-seater opened last month, in a difficult-to-find Bourke Street basement (more on this later), it became the third restaurant in Melbourne's CBD offering what is essentially Japan's answer to the degustation: a formal progression of courses, dictated by season, always anchored around a soup and main dish, but expanded with pickled things, rice courses and sashimi showdowns, depending on the context. In the contempo corner: Simon Denton's Kappo on Flinders Lane, where five-to-nine courses are built once you can pick or nix from a daily list of ingredients. 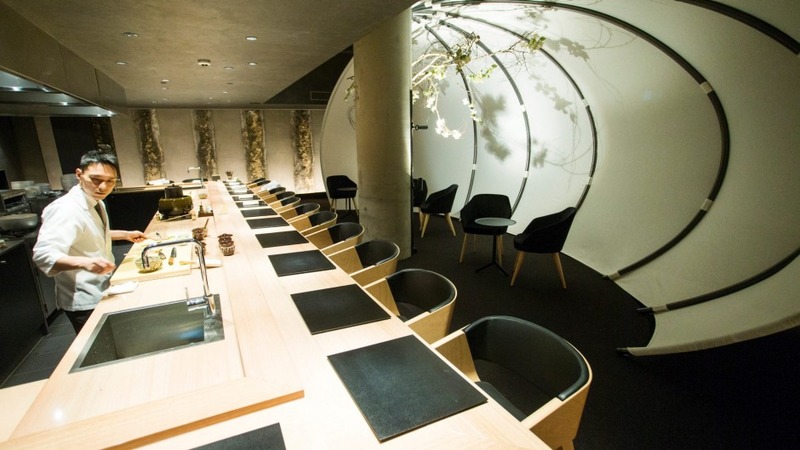 The Table, at Kisume, offers three hours and 15 courses of razzle dazzle (soup brewed in a coffee siphon; otoro sliced straight off the fish). But if you steer to the subtle, meditative and traditional; if you enjoy the fear of faux pas and feeling indelicate faced by moves of graced finesse, here is Ishizuka. Not the first kaiseki restaurant, but definitely occupying a niche of its own. It's the first solo venture for ex-Koko chef Tomotaka Ishizuka, occupying (take note, here) a very secretive space. Unless you've read the website instructions to proceed down the arcade to a keypad where you dial the basement (whereupon you'll take a lift down to another door, which is locked), you'll be one of the street-bound suckers making phone calls that don't always get answered. Annoying? It's worth it for the juxtaposition. You're ushered into what feels like the lair of the world's most stylish troll. Concrete columns line the walls, rough carved like ghostly trees. The counter is backdropped by rippled stone. The room smells cool and a bit like rice in mid-ferment. The mic drop, though, is a gigantic floor-to-ceiling lantern – crisp linen stretched across a frame – that looks somewhere between sails and a yurt. Cocooned in this, you might sit in velvet chairs with a sudachi and gin sour pinging of the fresh squeezed Japanese citrus, served in a glass that is heavy and deeply etched. It's luxe. It ought be. Ishizuka has hit the streets with next to the highest price point of $215 (Kappo is $190; The Table is now $220). The worth? That will always sit in the eye of the purse holder, but it's fair to say, no one's skimped. What do you want? Beluga caviar? Here it comes atop the first bite – creamy, grainy edamame tofu crowned with just-set scampi and a sucker punch of wasabi. How about some nimble finger work to prove the chefs are working? 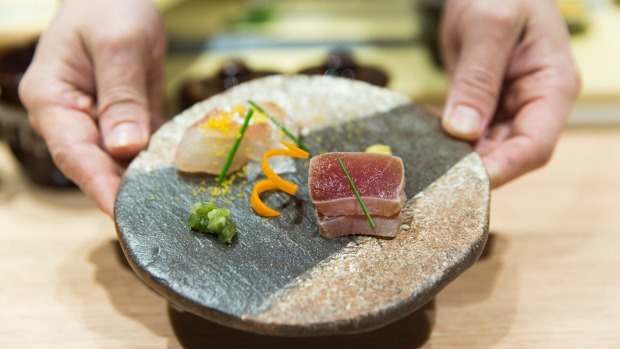 Behold your "Japanese delicacies", the portion of kaiseki dedicated to showing off. Today it's steamed egg custard and salmon roe in a shiny pot; cream cheese wrapped in cured salmon masquerading as cherries. 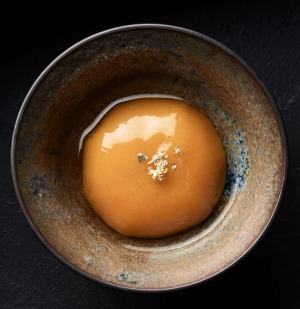 I don't love the corn over a firm little fish cake, but a curl of uni petrified in a vinegared jelly ball with raspberry is reminiscent of Peter Gilmore's sea pearls from Quay. If you find this course a little cutesy, it's not representative of the whole. The complexity of Ishizuka's dishes runs deep, and often incredibly subtle. 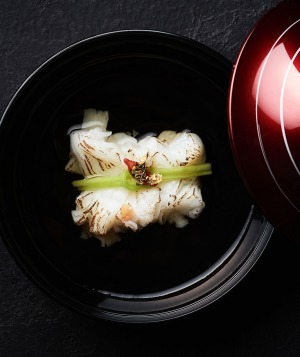 Our soup sees a ball of freshly dispatched crayfish washed in a dashi concealing junsai – a vegetable that tastes a little like tea and has jellied in the heat like basil seed. Sea perch, gently grilled and topped in a salty meringue with curls of uni, eats buttery-rich and almost meaty but is ethereally light – like a marrow-flavoured marshmallow toasted over a fire. This is definitely an adventure in Japanese tastes for the uninitiated palate. Duck breast, finely sliced, is slicked in a sweet, viscous stock, surrounded by turned vegetables and namafu – a delicacy of highly refined, flavoured gluten. It's texturally trippy stuff that sometimes demands much of your attention to yield reward. But those rewards are many: sashimi of kombu-aged snapper and soy-softened tuna emerge kid-leather soft. 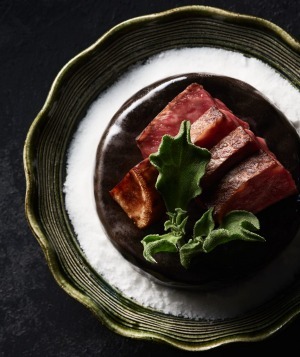 Nine-score wagyu hits the magic balance between crisped fat and mellow melt. Pale otoro (tuna belly, butter of the sea) is scored for texture and palmed into two perfect nigiri. Your chopsticks are spindly weapons. Every ceramic dish is a piece of art. Credit where due, making so much of it sing are wines from a list curated by ex-Rockpool somm David Lawler. It's a fun progression, acid-driven with sake interludes that all make sense. With that rich perch, a 2015 Tolpuddle chardonnay cracks it like a whip. Respect, too, for bringing you back from beef and Cote de Brouilly town with a Gembrook blanc de blanc partnering an oceanic palate cleanser of braised abalone with a paste of its own liver and a bright bonito jelly. No question, Ishizuka has the moves. Japanophiles, file in. Appreciate the mastery of the infamous dessert that places red bean in a starchy pumpkin jacket like the glossy yolk of an egg. To first-timers, know that this is far more meditative ryokan than raging party. You'll save your gossip, park your phone. But if you're ready for the ride, set coordinates and get lost. Drinks David Lawler's wine list is acid-bright, sake-rich and the cocktails are fresh. Pro Tip: Score the directions onto your hand or you will get lost in an office block. Go-to Dish: Sea perch with uni and meringue.